I’m not very good at keeping up with my blog schedule…I think I’ve bitten off more than I can chew and probably need to scale back on some things! Getting to Skype with my grandparents, and then my mom on Christmas Eve. Volunteering on Christmas Eve and making cookies for those who were working on post over the holidays. Making Christmas treats on Christmas Eve with my dad and sister. Pizza and game night with some friends at my place. Getting to take my sister to the airport for her two-week trip to South Africa. It definitely gave me wanderlust!! For more info on this blog series –>Weekly Small Pleasures Blog Event. 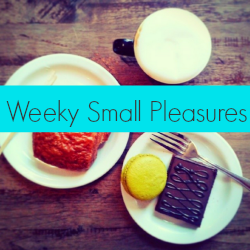 Welcome to my first installment of the Weekly Small Pleasures Blog Event! I’ve been meaning to start this for a few weeks now, but blogging on the weekend is tough! Since I’m in front of a computer all day during the week, I try not to be in front of the computer during the weekend…but anyways, the Weekly Small Pleasures Event (hosted by Mani at A New Life Wandering) “…is simply about remembering and sharing those small things that made you happy during the week; things that made you smile, made you laugh, made you do a happy dance, made your heart silently smile, or they even made you cry for joy.” I’m going to try to publish these on Sundays, but it probably will end up on the blog on Mondays. Having mom’s birthday dinner on Sunday before she left for Thailand on Monday. Spending time with mom on Monday night before she left, and booking a cruise for us in April. Tuesdays = Telework, so it’s always nice to work from home. Plus, I had a lot more time to work out. I went to a volunteer orientation meeting (for the USO) and I’m so excited to be helping with others and learning more about what the USO does. I am excited to volunteer for events too! Enjoyed my time at an “Orange Elephant” Christmas party, where we had lots of yummy snacks (all orange colored) and played white elephant. I ended up with some frozen margarita mixes, and since I don’t drink, I’m taking those to my next white elephant exchange this week.